I remember the end of September 2012, I was shaking in my shoes, carry on backpack strapped to me, one-way ticket in hand, ready to board a plane that would take me to Bangkok. It was exhilarating and terrifying at the same time, and in the months and years that have followed, those butterflies are still there when I board a plane to a new place where I don’t know anyone and have no idea what could happen. There are a lot of stages for solo female travelers including excitement, fear, and decision making from buying the ticket to actually going. Even though to the outside world it probably looked like it had been easy, and like I had everything figured out, it required planning and lots of questions. Once I got on the road, the benefits of sticking it out and going were so worth it! I could never have imagined that traveling alone would be so social, so freeing, and that I’d become so much more confident from it. I remember when I first started thinking about quitting my job and kind of throwing my life into upheaval to travel the world alone. I was reading blogs about how to do it, and I couldn’t believe that nobody was talking about the part that I found the toughest, those lurking, lingering fears of failure and loneliness. How could I get over them? I went back to the post I wrote when I put out there to everyone that I was going to travel the world alone. My old coworkers could read it, all of my friends and acquaintances knew that I quit my job and sold my stuff and packed up to leave. It was vulnerable and real, and a couple weeks later, I was on the plane. That’s how it is when you’re about to go into the unknown. It’s scary and exciting, and honestly, few things are better than being that jazzed about something. That’s the zone where greatness happens. I wrote this love letter to Cambodia a month into my journey, on cloud nine, higher than I’d ever felt on life. Traveling alone wasn’t so bad after all. I learned that the world wasn’t a scary place, I don’t have to have my whole life figured out yet, and that life is too short not to chase a few dreams. Need more inspiration? I love these travel quotes when I need a pick me up. Everyone deserves to feel that way. Commit to letting that happen for yourself! You know that fire that ignites in your chest and the rush of butterflies you get when inspiration hits to travel somewhere new? Your imagination runs wild with all kinds of possibilities but honestly, how do you narrow the whole world down to one place? There’s a lot to think about: Price, vibe, activities, weather, ease, the list goes on. How can you pick where to go? Think about where you can ease into it: I chose Southeast Asia because it’s cheap, there’s not a lot of violent crime, there were lots of other solo travelers, and it’s warm. More great options globally: Check out this list for some of my favorites after 4 years of first-hand research. Are you scared you’ll be alone? Read this. Are you worried you won’t make friends? Read this. Afraid of what your friends and family will think? Read this. Make a really solid savings plan and get honest with yourself about what you’re spending and where. Cut back on luxuries and you’ll be surprised at how much you save. Check out the chapters dedicated to how to cleverly save using plans that work, and tips and tricks to earn on the road, in my book on solo traveling. Go through the checklist on this 19-step guide for how to easily plan a trip, including how to find cheap flights. Not everyone is traveling long-term, but in case you are, here’s how I sold my entire apartment’s worth of stuff in one week. If there’s one incredibly valuable thing I’ve done during 75% of my nomadic existence since 2012, it’s packing carry on only. Honestly, I’ve done it for years! It is one of the best decisions I made to never have to pay extra baggage fees, worry that the airline lost my bag, and wait for them to put it on the carousel. It also gave me freedom to hoof it when I had to, take cheaper motorbike taxis, and easily keep track of everything. My biggest secrets for this were packing cubes (these have lasted almost 5 years of constant use) to compress my week and a half’s worth of clothes, and just buying cheap new stuff when I got tired of what I had and giving away the old. Sometimes I traded with fellow travelers as well or won the laundry lottery when the hostel accidentally gave back the wrong clothes. On that note, don’t bring anything you can’t live without or that can’t get dirty on your adventure. These videos have my best tips on how to pack light (sorry for the fairly novice and low-budget production quality, but the info is still stellar). Here’s the Southeast Asia packing list from the video. 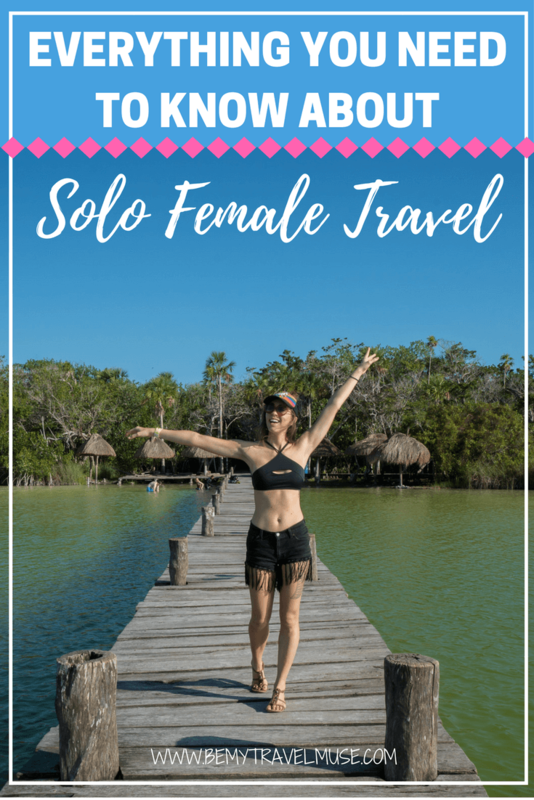 My biggest fear of traveling solo wasn’t whether I’d be safe (although that certainly mattered too! ), it was actually that I’d be lonely. I had no idea how many, if any, other girls were out there traveling alone and how easy it would be to meet people. It was actually SO MUCH easier than I thought, and it made me a more social and confident person as a result. Stay in places that are have high ratings for being social online, like hostels and backpackers accommodation. They usually have private rooms too if you’re not interested in dorms. Use these tips for how to have a more genuine travel experience. Plus, some advice on how to deal with down times, because they can happen anywhere, at home and abroad. Don’t worry too much about the times when you are alone, because it will happen and that’s okay. It’s a gift to get you all to yourself. We are influenced by those who know us, usually without even realizing it – the sum of the 5 people we’re around the most. As social creatures it’s what we do! But what about if you’re on your own? Then there’s nobody around to affect how you act, feel, and judge things. It’s all on you to define what you enjoy and what you want to do. That’s some powerful stuff, and every woman should get the chance to come up with her own identity, right? Make up your own mind without anyone coercing you when it comes to anything you are doing or might not want to do. If/when it feels wrong, stop and leave. You’re allowed to change your mind. Do what you do at home to stay safe – Don’t get intoxicated on a night out alone, don’t walk dark city streets alone at night, don’t be flashy. Want more tips? I asked 31 other solo female travelers how they stay safe on the road and this is what they said. I was really surprised to find that traveling on my own would be so beneficial to not just “finding myself,” but really, getting to know myself. I realized I’m brave, I can be quick on my feet, and that I wanted to be a writer and to follow that dream. It makes you confident in yourself and your abilities. If you can travel the world alone, what can’t you do? You tend to get better at problem solving because when there’s no sense in sulking and you can’t pass the buck, you become really good at making decisions. Your become more outgoing because travelers are friendly people and they’re easy to talk to. Traveling solo triggered all kinds of growth for me, what could it do for you? Traveling is all about those moments when you realize over a plate of mango sticky rice in Chiang Mai, Thailand, that you’re so darn happy to be on your own, to those times when you make a group of new friends while digging a giant hole on a beach in Tofo, Mozambique and are reminded why it’s so wonderful to travel the world. Documenting these amazing experiences and creating art in the form written word and photos from my trip has been an incredible way to never forget my travel stories, and to express how I saw them in my own way. I’ll always cherish this moments, and I’m pretty glad I have this blog so that I can remember them, and also because of the social network blogging opened up for me (and can for you, too). If you want to document yours too, here are some of my best tips for starting a travel blog. Traveling solo doesn’t mean that you have to come back with a bunch of photos that don’t have you in them, or are super crappy because someone else took them who didn’t put in the effort. Trust me, most of my Instagram photos are selfies that don’t look like selfies, and this is how I do them. If you’re new to photography, here are some of my favorite tips that made me a better photographer, and a tutorial on how I edit my photos, which is really where the magic is. I hope this solo female travel guide has helped you to get started on your journey, though I know there are still a lot of details that you might be wondering about things like your resume, how to handle working on the road or a sabbatical, what exactly to say to your concerned friends and parents, and how to handle things like mail forwarding and immunizations. 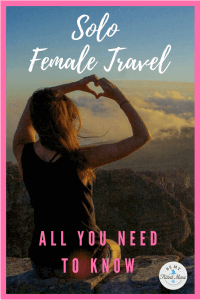 I’ve covered it all in Conquering Mountains, How to Solo Travel the World Fearlessly, plus case studies and advice from dozens of other solo female travelers. It’s basically this guide on steroids. If you found the info helpful here, imagine 80 more pages of specific advice designed to get you from idea to action. Happy travels, ladies, the world’s our oyster. Loved reading this! It has so much detail. You go girl. My first solo adventure was to New Zealand, and I am now moving abroad to Germany. That’s exactly what makes me like solo traveling so much, I don’t have to commit to anything, I can just move on whenever I feel like it. Travel truly is different for female travelers, Kristin. I’m glad there’s a guide like this. Question completely off topic…..Ava Apollo? Who? (in reference to your first ever post that you provided the link for). That was a pen name I used back in the day! That’s awesome. Glad you felt inspired! thanks so much for this! I’m getting ready for my SE Asia trip and was wondering what size is the packing cube you use in the video?